you cried and howled and paced. even though it hurts to move. though your hips cause you pain. and give you sleep, free from pain. I am so sorry the time has come. It is so very hard even when you know you are doing right by your companion. Your poem sums it up very very well. God Speed. We all know when we welcome those puppies that this day must come, but it doesn’t make it easier. I know, again my thoughts are with you. I’ be been going through the same thing, it stinks! Oh so beautiful, thank you for sharing. That is a beautiful sentiment! Thank you for sharing it here, I might not otherwise have come across it. Please tell me your doggie’s actually completely fine, and this isn’t actually happening. 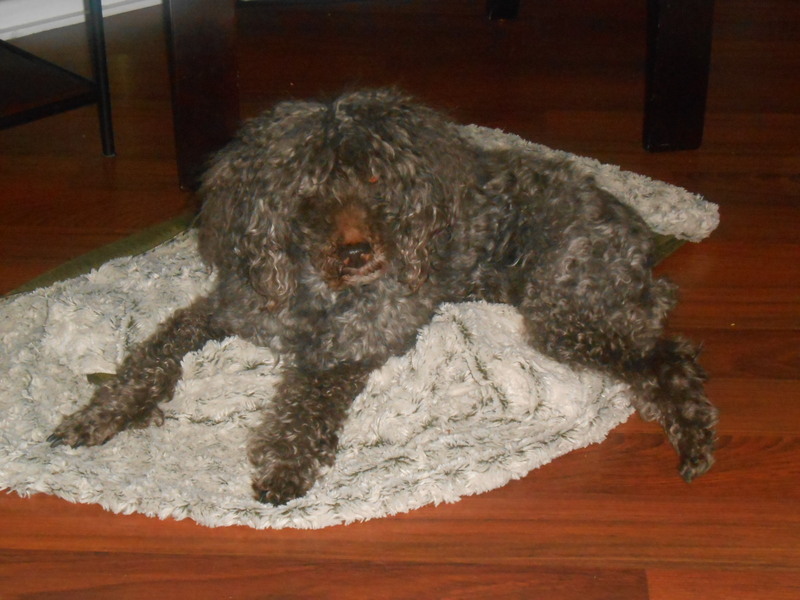 Sadly, my 16.5 year old miniature poodle is now 21 hours from eternity. Oh my god. I’m so sorry. Take care. Sending you hugs and love. This is so well done. Peace to you and yours. Oh god. This happened to us with our cat in November. I didn’t realize I had so many tears in me. The feeling of loss is indescribable, and the listlessness I felt as I waited for her to jump on my lap, as I listened for her toenails clicking on the hardwood floor, knowing these would never happen again yet still waiting for them…so difficult to bear. I send you hugs from across the continent, deep breaths, the comfort in remembering that the best of your relationship with this friend–the love you shared–will always remain. The most selfless act of love, so painful yet so necessary. My heart goes out to you on this longest night. Take comfort in knowing you did the very best, in life and now beyond, for your beloved companion. Hugs. Heartbreaking Shawn. I’m so sorry. Thank you, David. 16 hours and counting. You’ll see them again on the Rainbow Bridge. I am so sorry you are losing him. He’s playing with his brother at the bridge. A very heartfelt poem about losing a faithful canine, I read one on Goodreads a little while back. I will find it when Ihave a moment. It is poignant. An achingly beautiful tribute to a loyal friend. I feel this Ma’am, ’tis two months till the anniversary of the passing of my own belovéd companion, nine years and still I rue his passing ..
Well writ Ma’am, well writ ..
I’m sorry for your loss, Martin. They dig holes in our hearts that never quite recover. John Updike’s “Dog’s Death” and your poem “Last Day” are twin tributes to animals that assuredly DO LOVE their furless persons and are loved by them in return. I used to believe that Mr. Updike’s poem was the most magnificent testimony to the love between dog and human in all of literature. Now, I’m not so sure. Powerful and breathtakingly elegant, Shawn! Thanks, Ron, I appreciate the compliment. I spent several hours crafting another tribute poem for my Dusty Shadow last night, but I think it’s going to be a piece for magazine submission, so I won’t be posted it here. It’s always good to write something that you feel very satisfied with. I’m glad you enjoyed it, Len.